The Sony VPL-HW10 is based around the same 3-panel SXRD (Silicon X-tal Reﬂective Display) 1920 x 1080 chipset found in pricier VW40 and VW80 brothers. This model also boasts a remarkable 30,000:1 contrast ratio with the help of its automatic iris and, of course, Sony's picture-enhancing Bravia Engine 2 image processing. It's all squeezed into a symmetrically-sculpted glossy black body that's as happy sitting on a coffee table as it is clamped to the ceiling. A powerful 1.6x zoom provides some ﬂexibility, as do the horizontal and vertical lens shift. Zoom and focus are manual operations as opposed to motorised, but it's still a simple projector to operate with an intuitive OSD and big backlit remote control. Both HDMI inputs are v1.3 and can handle a 1080p24 signal – and the results from a competent Blu-ray player, like Sony's PlayStation 3, are suitably cinematic. The 24p True Cinema input suits the ﬁlmic quality of the pixel-packed SXRD chipset perfectly, to produce an image that looks exceedingly close to the genuine cinema experience. The Godfather has received a painstaking clean-up for Blu-ray and, although it still looks a little soft, it's brought to life by the Sony HW10 in vivid quality. Colours are particularly lifelike, with well rendered (and contained) reds especially. The automatic iris adjusts itself discreetly between light and dark scenes to ensure the contrast ratio is as close to the quoted 30,000:1 ﬁgure as possible and it certainly manages an impressive transition between shades to resolve all the detail in the dull indoor scenes of the ﬁlm. The lamp isn't overly bright, but it's still enough to show up all the detail in a dark room and the upside is there's virtually no fan noise at all. Scoring high on image quality, usability and ﬂexibility, there's little to stop me recommending this projector, especially as it lowers the entry-level for SXRD to such an attractive price. 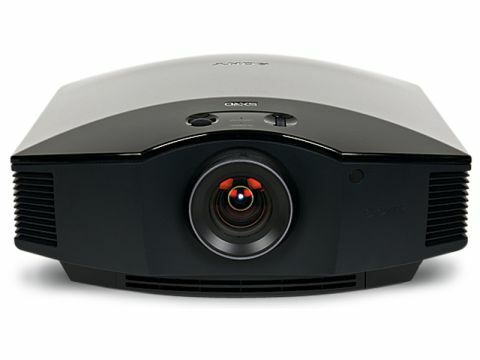 If you're looking for a slick big-brand projector, the stylish Sony HW10 doesn't disappoint.